Janitorial Services Serving the Greater Chicagoland area With ServiceMaster Cleaning Solutions-Every Day, Your Business Will Look Its Best What we offer You can count on ServiceMaster Cleaning Solutions unmatched commercial cleaning services throughout the Greater Chicagoland area. For over 60 years, we have developed the most effective methods and products to service all types of buildings including offices, research facilities, hotels, retail stores, hospitals, public entertainment venues, schools, banks. Over 200 organizations each day across the greater Chicagoland area trust ServiceMaster Cleaning Solutions janitorial services in the greater Chicagoland area to keep their facilities looking great every day. Whatever your service or scheduling needs, we can personally design a janitorial service plan just for you. 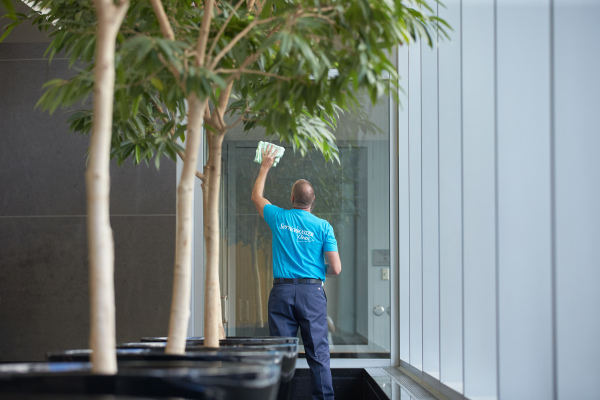 The ServiceMaster Commercial Cleaning Solutions edge Our teams are handpicked for their positive attitudes and commitment to providing unmatched janitorial services in the greater Chicagoland area as we are committed to do the job right the first time. We monitor each project’s progress, ensuring your satisfaction and fueling a continuous cycle of performance improvement. Plus, we are backed by national resources. If specialized needs occur, we have experts in pest control, landscape management, furniture restoration and more, standing by. At ServiceMaster Cleaning Solutions our commitment is to consistently do our job right and striving to make your job hassle-free. We believe our Purpose is To Serve our clients so they feel good and we feel good in Serving You! In addition to being committed, we’re also available 24/7. If we don’t meet your janitorial services expectations the first time, we’ll work to correct it immediately. Our commitment to thoroughly understand your needs and to create a customized cleaning plan for you. Contact us today at 708-333-1890 to create a specialized cleaning plan and start janitorial services with us. Dedicated to Making Your Building Look and Run its Best Your carpet is often the first impression you make when someone walks in your building. Make sure you look your best with Chicago carpet cleaning offered by ServiceMaster Cleaning Solutions Continued care Get the most out of your Chicago carpet cleaning. Our programs for continued care use innovative products and techniques along with the manufacturer’s latest care instructions to extend the life of your carpet and keep it looking clean and fresh. We help prevent soil from building up in the carpet fiber base and avoid the lifeless, dull look of carpets that are rarely ever cleaned. Routine carpet cleaning care also prevents matting, spotting, and extreme wear, leaving a more consistent and pleasant appearance overall. Enhance the lifetime of your carpet and avoid the cost of frequent replacement, all for a low monthly investment. Our fees are clear and manageable which eliminate surprises and increased costs from one carpet cleaning to the next. Commercial carpet cleaning in Chicago We have the experience and most advanced methods and materials for preserving your carpet’s appearance and your company’s image. That’s why thousands of businesses depend on ServiceMaster Cleaning Solutions nationwide for commercial specialty cleaning needs. Maintains your carpet's rich color & texture Promotes a consistent carpet appearance Reduces wear, especially in high traffic areas Utilizes the most current innovations in carpet Cleaning care Extends the life of your carpet investment Thoroughly monitors your carpet’s condition Offers simple, no-surprises billing Our commitment to thoroughly understand your needs and provide simple billing are just two of the ways we make it easy to do business with us. Contact us today at 708-333-1890 to create a specialized carpet cleaning plan! Commercial Disaster Recovery in Chicago Emergency response team: minimizing business interruptions, restoring peace of mind.® When disaster strikes at your commercial building, ServiceMaster Clean® is prepared. As part of our commitment to deliver “above and beyond” service, our dedicated Emergency Response Team, specializing in Commercial Disaster Recovery in Chicago, can mobilize quickly to help minimize any disruption to your business. In the event of a fire, flood, smoke damage or other disasters, our network of experienced disaster recovery professionals can be on-site within 2–4 hours. This prompt action can save valuable documents, inventory, and property that might otherwise be unsalvageable. Getting you back in business is our number one priority. And, we have the tools necessary to minimize your loss and business interruption. Our team of experts provides comprehensive services from emergency procedures planning to mitigation and reconstruction. When disaster strikes, contact your ServiceMaster Clean representative or call 708-333-1890. We’ll dispatch an Emergency Response Team to help you get back to business fast! The Easy Choice For Your Hard-Surface Floors Beautiful hard-surface floors can be one of the most impressive features of your facility. When maintained on a regular basis with the correct cleaning processes; attractive, well-maintained floors can help enhance your professional image, while providing a clean, safe working environment for all employees and guests. 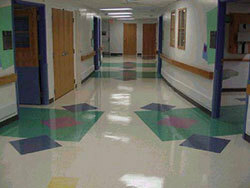 Count on ServiceMaster Cleaning Solutions to keep your hard-surface floors looking their best. Whether they are marble, vinyl, ceramic, quarry, tile, wood or other materials. We will personally custom design a care plan to fit your needs. ServiceMaster Cleaning Solutions uses the best floor care products, most innovative equipment and methods for optimal effectiveness. With our 60+ years of experience in the field, we have the expertise to service hospitals, schools, grocery stores, retail stores, high-tech and many other kinds of facilities. Maximize your hard-surface floor care program by investing your business with us, ServiceMaster Cleaning Solutions. 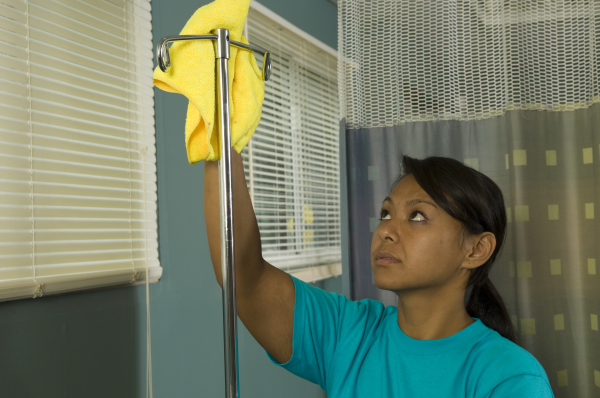 Hospital and Medical Cleaning Services Chicago - Treating Healthcare Facilities For Over 55 Years! At ServiceMaster Clean® we have a long history of healthcare facility cleaning in Chicago, providing healthy living and working environments. We partner with you to understand your unique needs and monitor the overall condition of your facility. We serve as an extension of your staff, completing your task schedule the same way every time and priding ourselves on going above and beyond your expectations. ServiceMaster Cleaning Solutions offers reliable teams that take a health-conscious approach to medical cleaning including removing visible dirt, sanitizing, improving air quality and reducing allergies. Our expertise has led to the development of the most advanced methods and materials to keep your facility looking and running its best. 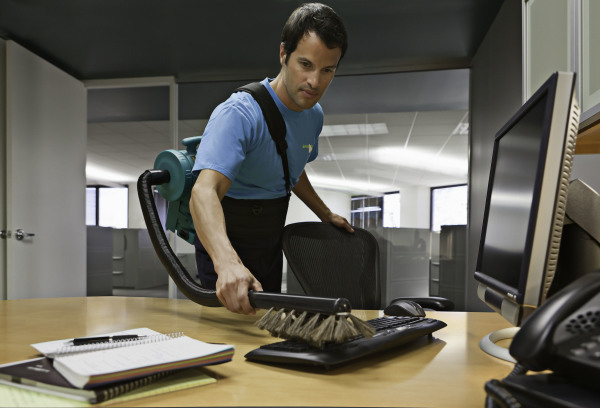 In addition to regular tasks like trash collection, dusting, damp mopping, restroom care, floor and carpet care, window washing and more, we provide the following commercial cleaning services in Chicago: Collecting and removing sharps Checking and changing privacy curtains Thoroughly cleaning stairs and other high-traffic areas Cleaning equipment exteriors Sanitizing IV poles, beds, wheelchairs, workstations, etc... ServiceMaster Cleaning Solutions also provides services to address areas of your facility that might have specialized cleaning needs, such as: Urgent care centers Diagnostic imaging/MRI Community accessible rehabilitation Renal dialysis Non-medical areas, including eating areas No Matter your service needs, budget or schedule, we will design a plan to fit you. Contact us today at 708-333-1890 to create a specialized cleaning plan! Does Your Restroom Grout Sparkle? “Maintaining tile and grout at a high appearance level is an impossible task for facility management.” Weary of soiled unmanageable bathrooms that never stay clean? 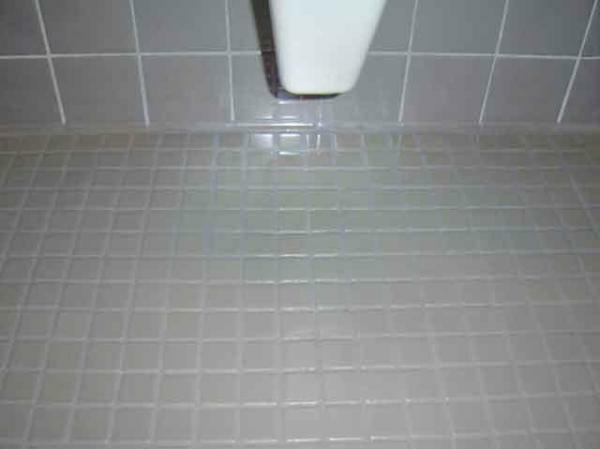 The cleanliness and appearance of grout influence everyone that sees it. Does the worn and stained grout present the precise impression of your facility you desire, or does it share a different story? No matter which way you view it, grout and tile are two separate wear surfaces and therefore handle traffic and dirt differently. Instead of your staff pulling their hair out trying to keep both surfaces clean, how much relief would it give to have one uniform wear layer your facility could easily maintain for years and years? Traditionally, grout and tile have been a nightmare for maintenance. Dingy, dirty, disgusting. The feeling of bright and cheery with bathroom grout has never been truly attainable. Until now! ServiceMaster Clean has the answers with a break-through chemistry technology known as NEVERSTRIP, that chemically and mechanically restores grout color back to its original splendor... But it doesn’t stop with mere grout restoration. After all, that would only put you back in the same position in a mere matter of months. NEVERSTRIP includes a single wall-to-wall top-coat wear layer over the grout and tile that takes your protection to the next level. 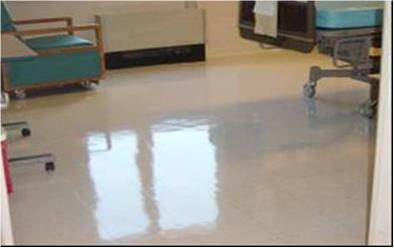 Behold the revolutionary floor coating system that your facility staff will be RAVING about. From grout to ceramic floor restoration in Chicago, we have you covered! Choose from multiple levels of sheens from high to matte finishes, so you can find a solution that not only looks fantastic but which accurately reflects your facility image. Sound too good to be true? ServiceMaster Clean wants your worst challenge…. NEVERSTRIP is the solution that fully and completely restores grout color back to its original brilliance and saves you fistfuls of dollars while doing so. Not only will the beauty of your new floors draw praise from your staff, but visitors and employees will instantly notice the “Cleaner, Brighter” appearance. In the human mind, clean equals sanitary, so sparkling grout can offer more benefits than meet the eye including increased morale and a portrayed sharper image. And there are no hidden “Maintenance package requirements. After the restoration, ServiceMaster Clean walks away from the floor, putting it back into your capable hands. Don’t take our word for it though…. Put ServiceMaster Clean to the test. 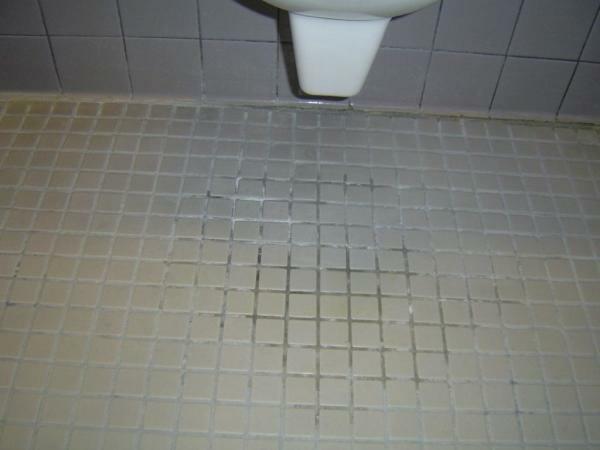 Find the worst bathroom floor you have in your facility, and do a side by side comparison over a three, six or twelve month period, and find out for yourself why you don’t have to settle for dingy grout ever again! ServiceMaster Clean offers local ceramic floor cleaning in Chicago plus MORE! Contact us today! Commercial Upholstery Cleaning in Chicago - Protect Your Business’ Most Valuable Assets With ServiceMaster Clean Upholstery cleaning and preservation: Keep your upholstery’s appearance professional and avoid the cost of replacement with commercial upholstery cleaning in Chicago from ServiceMaster Cleaning Solutions. Our highly effective systems clean a wide variety of fabrics, improving the appearance of your facility. Working with manufacturers’ suggested treatments along with our unique materials and techniques; we can carefully pre-treat, cleanse and dry your upholstery. Chairs, sofas, fabric screens and other office furnishings are cleaned on-site and are ready for use the next business morning. Wood furniture cleaning and protection: Wood furnishings are a valuable investment for your business. Make sure they are protected properly with the expertise of ServiceMaster Cleaning Solutions. We use highly developed products, processes and equipment to gently, but effectively clean and preserve wood furnishings, ensuring lasting beauty and a professional appearance. Our products are specially formulated to nourish and enhance wood surface depth and sheen. We exclude harmful ingredients like alcohol and silicone, which actually damage wood finishes and attract dust, rings and finger marks. No matter your service needs, budget or schedule, we will personally design a plan to fit you. Contact us today at 708-333-1890 to create a specialized cleaning plan! Why should you have your rafters and high ceilings cleaned? Vibrations in the facility can shake built up dust loose, causing it to contaminate the production below. 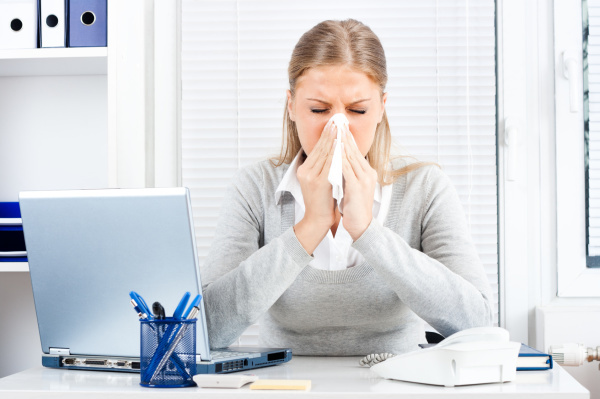 Piles of dust and dirt can become breeding grounds for mites, mold, bacteria, viruses, and other pollutants. Some dusts can become a fire hazard when built upon high surface areas. Numerous explosions have occurred when built up dust created an explosive dust cloud. OSHA & the NFPA can give violations and fines for having unsafe levels of dust on ceilings and rafters. Chunks of this collected debris can enter the ventilation and clog up the HVAC system. Can cause odors and break down the surface it’s on, causing rust or rot. Aesthetic reasons, visible dirt collected on surfaces can make a workplace unattractive. 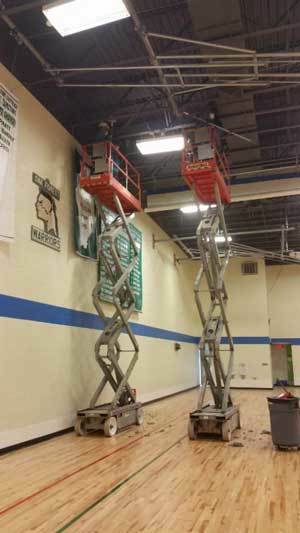 To prepare surfaces for painting or other maintenance work. Creates poor indoor air quality, which according to the EPA is a leading environmental threat and cause of airborne sickness. We specialize in cleaning projects for commercial and industrial facilities, and we’re focused on safety. Our technicians are OSHA trained, experienced working on high surfaces, and we’re experts in combustible dust safety. Our Commercial and Industrial High Surface Cleaning Services include: Ceiling Ceiling Truss Rafters Conduit Lighting Exterior of ductwork Exhaust hood ventilation Beams Storage racks/shelving Fire suppression systems Ceiling Deck Piping And other elevated structural components Qualifications In OSHA’s Combustible Dust National Emphasis Program, two of the most common citations were improper housekeeping, including combustible dust accumulation, and use of compressed air to blow down combustible dust. ServiceMaster abides by standards set by the NFPA, NADCA, and OSHA when performing combustible dust cleaning. ServiceMaster's Neverstrip is high performance hard surface floor coating in Chicago that delivers a durable, long-lasting shine. We specialize in cleaning projects for commercial and industrial facilities, and we’re focused on safety. Our technicians are OSHA trained, experienced working on high surfaces, and we’re experts in combustible dust safety. Count on ServiceMaster Cleaning Solutions unmatched commercial cleaning services in Chicago. For over 60 years, we have developed the most effective methods and products to service all types of buildings including offices, research facilities, hotels, retail stores, hospitals, public entertainment venues, schools and even the airline industry. Over 100,000 organizations trust ServiceMaster Cleaning Solutions janitorial services in Chicago to keep their facilities looking great every day. Whatever your service or scheduling needs, we can personally design a janitorial service plan just for you! At ServiceMaster Clean® we have a long history of healthcare facility cleaning in Chicago, providing healthy living and working environments. ServiceMaster Cleaning Solutions offers reliable teams that take a health-conscious approach to medical cleaning including removing visible dirt, sanitizing, improving air quality and reducing allergies. Traditionally, grout and tile have been a nightmare for maintenance. Dingy, dirty, disgusting. The feeling of bright and cheery with bathroom grout has never been truly attainable. ServiceMaster Clean offers local ceramic floor cleaning in Chicago plus MORE! Contact us today! NeverStrip is the solution that fully and completely restores grout color back to its original brilliance and saves you fistfuls of dollars while doing so. Not only will the beauty of your new floors draw praise from your staff, but visitors and employees will instantly notice the “Cleaner, Brighter”appearance. In the human mind, clean equals sanitary, so sparkling grout can offer more benefits than meet the eye including increased moral and a portrayed sharper image. Vibrations in the facility can shake built up dust lose, causing it to contaminate the production below; Piles of dust and dirt can become breeding grounds for mites, mold, bacteria, viruses, and other pollutants.